Dhata, Vidhata, Shukra, Chyavana and Bhargavi [Vidhata married Ayathi] Vidhata's son is Mrukandu and Mrukandu's son is Markandeya who is chranjeevi. Markandeya's son is Bhavana Rishi and Bhavana Rishi married to Bhadravathi. She was daughter of Sun. They have 101 Children and they called as Padmashali. 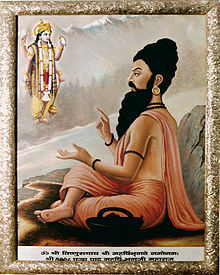 Maharishi Bhrigu (Sanskrit: Bhṛgu) was one of the seven great sages, the Saptarshis, one of the many Prajapatis (the facilitators of Creation) created by Brahma. He was born in Ballia. The first compiler of predictive astrology, and also the author of Bhrigu Samhita, the astrological (Jyotish) classic, Bhrigu is considered a Manasa Putra ("mind-born-son") of Brahma. The adjectival form of the name, Bhargava, is used to refer to the descendants and the school of Bhrigu. According to Manusmriti, Bhrigu was a compatriot of and lived during the time of Manu, the Hindu progenitor of humanity. Bhrigu had his Ashram (Hermitage) on the Vadhusar River, a tributary of the Drishadwati River near Dhosi Hill in the Vedic state of Brahmavarta, presently on the border of Haryana and Rajasthan in India. Along with Manu, Bhrigu had made important contributions to Manusmriti, which was constituted out of a sermon to a congregation of saints in the state of Brahmavarta, after the great floods in this area, nearly 10,000 years ago. As per Skanda Purana, Bhrigu migrated to Bhrigukutch, modern Bharuch on the banks of Narmada river in Gujarat, leaving his son Chyavana at Dhosi Hill. He was married to Khyati, a daughter of Daksha. They had two sons and one daughter, named Dhata and Vidhata. Their daughter Lakshmi married Vishnu (Narayana). He had one more son with Kavyamata (Usana), who is better known than Bhrigu himself – Shukra, learned sage and guru of the asuras. The sage Chyavana is also said to be his son with Puloma. [Maha:1.5] One of his descendants was sage Jamadagni, who in turn was the father of sage Parashurama, considered an avatar of Vishnu. Bhrigu finds mention in Shiva Purana and Vayu Purana, where he is shown present during the great yajna of Daksha Prajapati (his father-in-law). He supports the continuation of the Daksha yajna even after being warned that without an offering for Shiva, it was asking for a catastrophe for everyone present there. In the Bhagavad Gītā, Krishna says that among sages, Bhrigu is representative of the opulence of God. Bhrigu's Ashram 'Deepotsaka' was located at the base of Dhosi Hill in present-day village Dhosi on the border of Narnaul district in Haryana and Jhunjunu district of Rajasthan, from where he migrated to Bharuch. His son Chyavana, known for Chyavanprash also had his Ashram at Dhosi Hill. Bhrigu is also worshipped at Bharuch, Swamimalai, Tirumala, Ballia, Nanguneri, Thiruneermalai, Mannargudi. An Ashram for Bhrigu is in Maruderi, Kanchipuram district in Tamil Nadu. Khedbrahma in Gujarat is associated with Brahma and Bhrigu 's legend of testing Trinity. Lastly Bhrigu migrated to Bhuinj Satara, Maharashtra where he took Samadhi. His ashram and his daughter's laxmi's temple also situated there. His sons chyavan's ashram and samadhi is also situated on chyavaneshwar hill near Bhuinj. Many great sages gathered at the bank of river Sarasvati to participate in Maha yagya. Bhrigu was arrogant and was filled with ahamkara due to his extreme austerities. All the great saints and sages could not decide that out of the Trinity Lord Vishnu, Brahma and Shiva who is pre-eminent and to whom should they offer Pradhanta (Master) of that yagya. With the consent of all the great saints present there, it was decided that Bhrigu will test and decide who was pre-eminent. Upon being entrusted with the task Maharishi Bhrigu decided to test each of the Trimurti. Being ignored by Lord Brahma and Lord Shiva, he visited Lord Vishnu. Vishnu was asleep and Brighu kicked him in the chest to wake him up.Vishnu smilingly welcomed Bhrigu who realised his egotistical outbursts with extreme pain. He begged for forgiveness and Vishnu forgave him. After the incident of testing of trinity, Bhrigu decided to write his famous book of astrology, the Bhrigu Samhita, to help Brahmins earn their living. Maharishi Bhrigu collected birth charts, wrote full-life predictions and compiled them together as Bhrigu Samhita. Bhrigu Samhita is believed to be the one of the first book of its kind in the field of astrology. ^ Narada said.. The Mahabharata translated by Kisari Mohan Ganguli (1883 -1896), Book 2: Sabha Parva: Lokapala Sabhakhayana Parva, section:XI. p. 25 And Daksha, Prachetas, Pulaha, Marichi, the master Kasyapa, Bhrigu, Atri, and Vasistha and Gautama, and also Angiras, and Pulastya, Kraut, Prahlada, and Kardama, these Prajapatis, and Angirasa of the Atharvan Veda, the Valikhilyas, the Marichipas; Intelligence, Space, Knowledge, Air, Heat, Water, Earth, Sound, Touch, Form, Taste, Scent; Nature, and the Modes (of Nature), and the elemental and prime causes of the world – all stay in that mansion beside the Lord Brahma. And Agastya of great energy, and Markandeya, of great ascetic power, and Jamadagni and Bharadwaja, and Samvarta, and Chyavana, and exalted Durvasa, and the virtuous Rishyasringa, the illustrious 'Sanatkumara' of great ascetic merit and the preceptor in all matters affecting Yoga..."
^ Gopal, Madan (1990). K.S. Gautam, ed. India through the ages. Publication Division, Ministry of Information and Broadcasting, Government of India. p. 78. ^ David Frawley, quoting Grahm Hancock in "Underworld" : Flooded kingdoms of the Ice Age, A Vedic and Indian Perspective. ^ Subodh Kapoor (2004). A Dictionary of Hinduism: Including Its Mythology, Religion, History, Literature, and Pantheon. Cosmo Publications. pp. 185–. ISBN 978-81-7755-874-6. ^ George Mason Williams (2003). Handbook of Hindu Mythology. ABC-CLIO. pp. 160–161. ISBN 978-1-57607-106-9. ^ Yves Bonnefoy; Wendy Doniger (1993). Asian Mythologies. University of Chicago Press. pp. 82–83. ISBN 978-0-226-06456-7. ^ Vishnu Purana SACRIFICE OF DAKSHA (From the Vayu Purana.) The Vishnu Purana, translated by Horace Hayman Wilson, 1840. 67:6. ^ Koʻmarhanʻ, Mranʻ mā Nuiṅʻ ṅaṃ Samuiṅʻʺ. Myanmar Historical Commission conference proceedings. Myanmar Historical Commission, Golden Jubilee Publication Committee. Retrieved 12 August 2018. ^ Experts, Disha (1 May 2017). The History Compendium for IAS Prelims General Studies CSAT Paper 1, UPSC & State PSC (Second ed.). Disha Publication. ISBN 9386323443. ^ Rao, T.M. Bhrigu Samhita. Pustak Mahal. ISBN 8122310214. Retrieved 12 August 2018. ^ Eyzdagird, Erhiem. Bhrigu Samhita: el Primer Libro de Astrología Védica: Traducción Al Español de Manuscritos de Hojas Del período Védico. Independently Published. ISBN 1980573212. Retrieved 12 August 2018.